SHIFTboston blog» Blog Archive » And the Winner Is of the Glow Forum…..Crystal Sun! 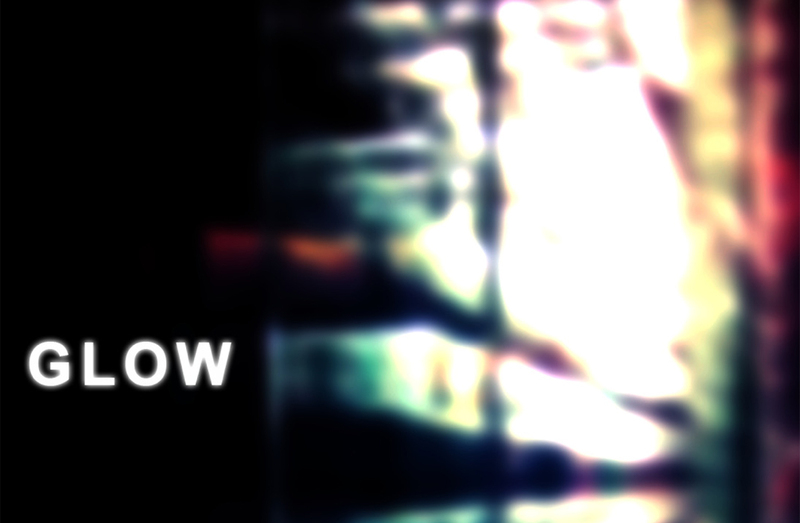 We would like to congratulate Robert Levit and Rodolphe el-Khoury as their proposal ‘Crystal Sun’ has been selected as the winner of the GLOW 2012 Competition! Both Robert and Rodolphe are partners at Khoury Levit Fong. Robert and Rodlphe are working on the second phase of Crystal Sun with engineering consultant David Bowick, P. Eng. of Blackwell Engineers and with the lighting firm Hilight. SHIFTboston will be hosting a celebratory event in honor of their submission this January – details will be announced in soon. We want to thank everyone for their participation in the SHIFTboston GLOW Competition and we encourage you to stay connected with: the SHIFTboston blog to find out more about the upcoming GLOW 2012 final event. SHIFTboston: What was your inspiration while designing Crystal Sun? Robert & Rodolphe: There were a number of things we thought about. 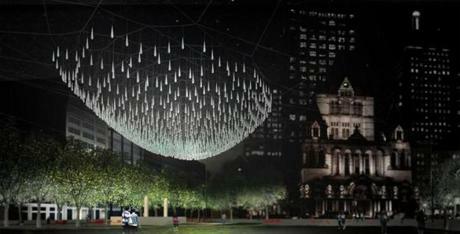 But perhaps foremost was the idea of treating Copley Square as a large urban room illuminated by an iconic chandelier. Crystal chandeliers have a huge impact on the way people experience rooms in buildings—they are iconic set pieces that make big first impressions and become associated with the rooms they illuminate, but, equally important, they also quickly become background material casting light onto activities and things taking place within the room and receding from the forefront of consciousness. We like this dual aspect of the chandelier because we think it is important to draw together the diverse elements of Copley Square, which in spite of being flanked by some of the most beautiful and significant buildings in Boston and even American architectural history, nevertheless remains a bit of a jumble. We feel that both the iconic object of the chandelier and the centralized illumination that it casts will draw together the space of Copley Square making an urban room of a space that otherwise drifts off in too easily. The structure itself is a catenary mesh of suspended cables. What seems exciting to us is that such forms have a particular history in infrastructure—in bridges for instance, but also in the refined models of the Catalan architect Antonio Gaudi. Like Gaudi, we would like to think that we are able to draw together innovative technical feats with meaningful esthetic practices linking together two familiar formal idioms but in terms that are unexpected, exciting, and culturally resonant in the imagination of the public. SHIFTboston: What impact or experience do you want visitors to take away from viewing Crystal Sun? Robert & Rodolphe: People will feel as if they are in the warm and scintillating halo of room lit by a crystal chandelier. It is also our intention to illuminate the surrounding park and buildings (with the cooperation of surrounding building owners and stakeholders) with secondary illumination. This supplementary lighting will be coordinated digitally with the light of the chandelier in order to give the impression that the whole space of Copley Square is lit by the chandelier without requiring excessive, visually uncomfortable, and inefficient illumination intensities originating in the chandelier proper. Think of a movie set in which the flick of a switch illuminates the whole set as if from visible light sources but in fact is lit by many invisible fixtures to obtain the desired effect. We think the effect will be magical because it will seem both natural but not entirely understandable. We would like to see different guest “curators” of Copley Square illumination to be invited to develop lighting schemes taking advantage of the combination of visible and invisible light sources that we have proposed. SHIFTboston: What is your biggest installation challenge regarding Crystal Sun and how do you plan on overcoming it? Robert & Rodolphe: The cable network and pendant light fixtures need to be secure against wind. The cable network will be developed as a tensegrity structure to allowing for it to acquire necessary rigidity. We must guard against ice build-up on such a suspended and pendant structure, which can be done through moderate de-icing currents sent through cables. The heaviest piece of at-grade construction will be the four columns which will be used to suspend the chandelier. We will want to make sure that their position and quality does not diminish the quality of public space in Copley Square but rather that the quality these engineered elements are beautiful in themselves. SHIFTboston: How will Crystal Sun highlight the historic buildings in Copley Square? Robert & Rodolphe: Like chandeliers in rooms that illuminate the surrounding space of the room and compliment what historically were often quite elaborate and beautiful walls, so too our proposition for an urban chandelier will illuminate and compliment the surrounding buildings of Copley Square. As mentioned above, these buildings will be illuminated as if from the single source of the chandelier lending a harmonious relationship to the diverse buildings that shape and anchor the square. These buildings, without losing any of their individual distinction, will be drawn together or seated, so to speak, at a single table. Crystal Sun’s position is central to Copley Square, but outside of the visual axis that runs between the Boston Public Library and Trinity Church. These two buildings will continue to enjoy an unobstructed relationship to each other. And just as in a room the diverse views afforded by movement through space will make of the changing relationship between chandelier and buildings a rich experience. The light, seemingly ephemeral aspects of the chandelier manage to introduce an important and large element into the square while maintaining a light footprint deferring to the historic buildings that surround Copley Square. SHIFTboston: What types of materials will you be using to create Crystal Sun? Robert & Rodolphe: The cable structure is to be made of stainless steel cables, the light fixture hardware will also be of stainless steel. The light fixtures will be of cast tear drop shaped acrylic light diffusers. The lights themselves are low energy consumption LEDs. The columns will be made of steel-reinforced concrete or steel. SHIFTboston: If approved by the city, how long will Crystal Sun be installed and when will it be installed? Robert & Rodolphe: The intention is that the project is a permanent work of urban illumination. Such questions will need to be ironed out through future discussions. Crystal Sun has also been featured in the Boston Globe – click here to read more!